Please join me tomorrow when the 3rd Annual ONE Queer Film Fest will screen two short films that I executive produced that also happen to be by my daughters Marka and Xochi Maberry-Gaulke. 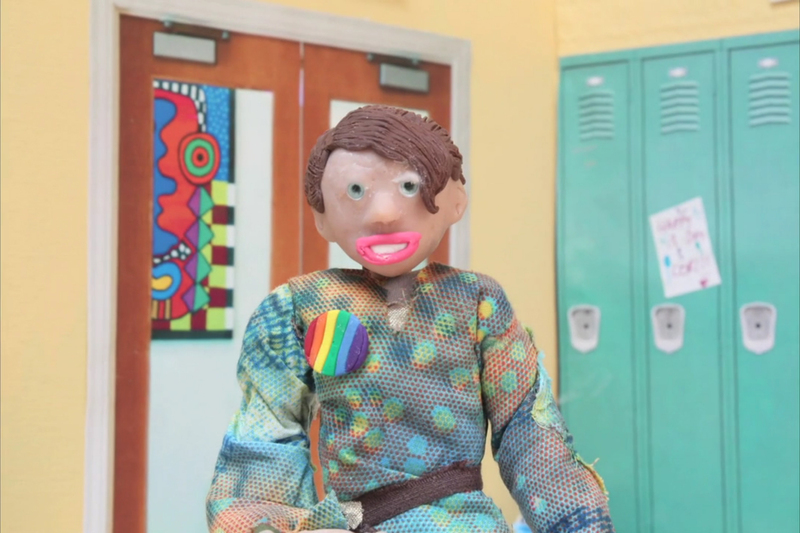 “This PSA is Gay” was written by Marka and turned into a Claymation by students in my Harvard-Westlake Summer Film Program. 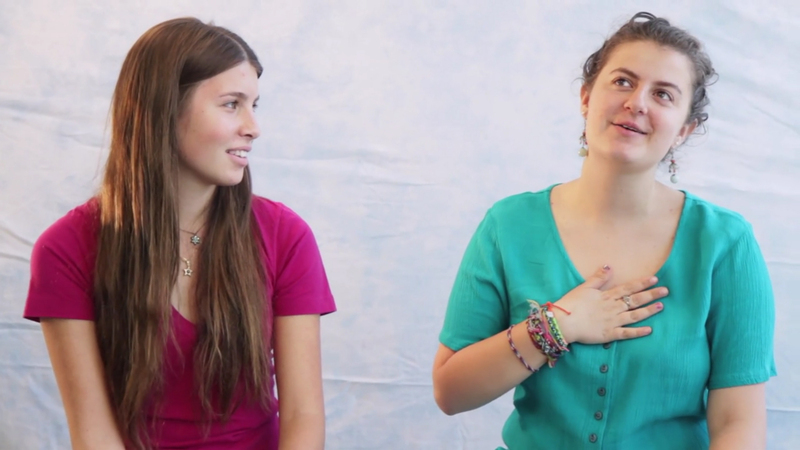 “Love Our Families” is a public service announcement created by Xochi and her friend Anjoum Agrama during The Righteous Conversations Project, which brings together Holocaust survivors and teens to make PSAs about contemporary injustices. In addition, Marka and Xochi are featured as subjects in a documentary by Lisa Udelson and Catherine Opie called “Same Difference.” There’s a link to the trailer below. There are screenings all day long and we are part of the HERE & NOW: Youth & Family Shorts Series from 1 – 2:30 PM at the REDCAT (under Disney Hall). Tickets are available at http://www.redcat.org/event/one-queer-film-festival and cost $13 in advance and $16 at the door. The fest is a celebration of the rich cultures and diversity within our LGBT communities. All proceeds benefit the great work of ONE National Gay & Lesbian Archives, the world’s largest LGBT history collection (based right here in LA)! Screening followed by panel and Q&A with filmmakers including Cheri Gaulke, Marka and Xochi Maberry-Gaulke. Panel moderated by James Gilliam, Deputy Director of ACLU Southern California. THIS PSA IS GAY (Miranda Kasher, George Khabbaz, Patric Verrone, Marka Maberry-Gaulke, Albert Zeng) – When a girl wears a rainbow button to school, she discovers that people’s words can sting! THRESHOLDS (Yovani Flores) – An urban tale about pushing barriers in the moments lived between each breath. TWO BOYS (Victor Bumbalo) – Two recently transplanted New Yorkers, a mother and her sixteen year-old-son, are lugging a Christmas tree through the streets of Los Angeles unaware of what Christmas has in store for them. LOVE OUR FAMILIES (Anjoum Agrama, Xochi Maberry-Gaulke, Gabe Benjamin) – A Public Service Announcement that looks at the true meaning of family. SPIRAL TRANSITION (Ewan Duarte) – A compelling, candid, and interwoven documentary exploring the filmmaker’s relationship with his mother as he transitions genders. SAME DIFFERENCE (Lisa Udelson and Catherine Opie) – Among the cries of “What about the children?” during the debate over California’s Proposition 8, where were the voices of actual children? 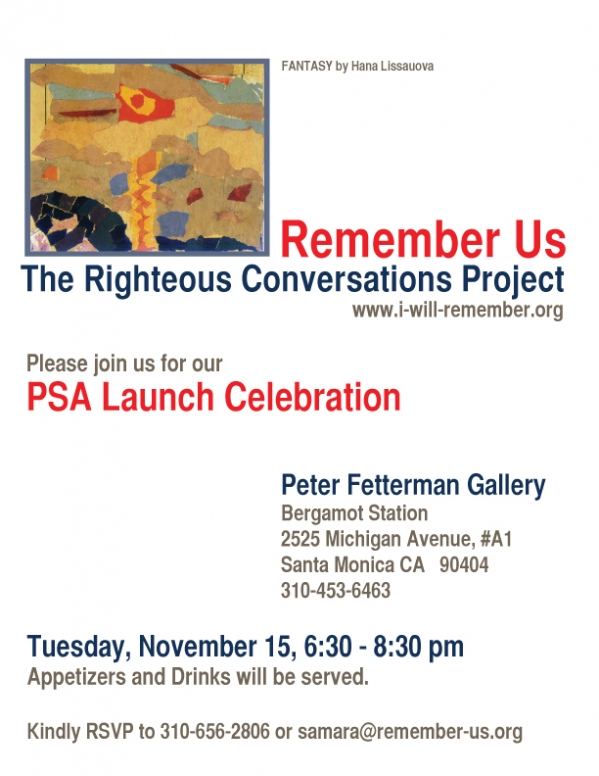 Join us tonight, November 15, 6:30-8:30 pm, at a Launch Celebration for Public Service Announcements from The Righteous Conversations Project. I am the artistic director for this wonderful cross-generational project that empowers teens to use media to speak out about injustices in our world. My daughter Xochi Maberrry-Gaulke participated in our pilot workshop and created one of the PSAs with her friend Anjoum Agrama. We are currently developing new workshops for this coming summer which will be offered through Harvard-Westlake’s summer program.Tonight’s event takes place at Peter Fetterman Gallery, Bergamot Station, 2525 Michigan Avenue, #A1, Santa Monica, CA 90404, 310. 453-6463. Appetizers and drinks will be served. Kindly RSVP to 310. 656-2806 or samara@remember-us.org. On Tuesday, November 15th the Righteous Conversations Project will be screening two new media PSA’s created by Los Angeles Teens and Holocaust Survivors in an extraordinary intergenerational workshop taught by Cheri Gaulke that took place at Harvard-Westlake last year with participation by students from Harvard-Westlake, Crossroads, and Marlborough Schools. The Righteous Conversations project, a pilot program that connects Holocaust survivors and teens in a dialogue of remembrance and social conscience, was founded last year at Harvard-Westlake School by five students with support from Remember Us, a non-profit organization that invites personal connection to the name of one child who perished in the Holocaust in the hope that young people will honor their memory by acting, in their names, for good in the world today. Over a one week period, students worked in partnership with the survivors, using the narratives of survivors and the nature of their personal histories as a source of inspiration for creating new media messages about a contemporary issue that resonated with the workshop participants. In this photographic exhibit, Ryan explores the meaning and nuance of these historic partnerships between young Californians and elder survivors, who were themselves young at the time of the Holocaust. These photographs commemorate the momentous encounter between teens and the last generation of survivors while celebrating the intersection of memory and social consciousness. 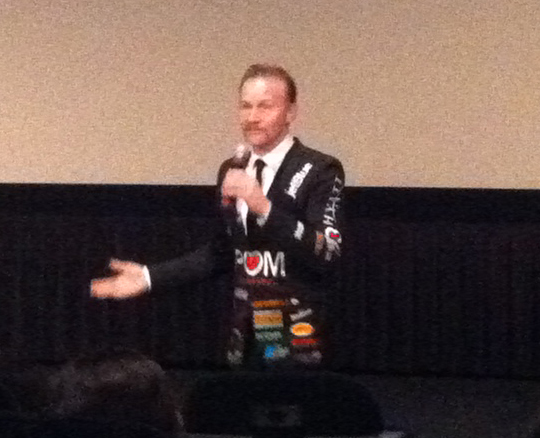 Last night I attended a screening followed by a Q and A with one of my heroes — Morgan Spurlock. Spurlock’s new film POM Wonderful Presents The Greatest Movie Ever Sold was a look into the world of product placement in films. His concept was to make a movie about product placement that was entirely funded by product placement. Spurlock brings a wonderful personal style to his work – a balance of humor and social critique. He’s similar to Michael Moore but Spurlock projects more heart or at least personal warmth. At one point in the film he was psychoanalyzed by professionals that help companies determine what kind of brand they are. They decided Spurlock’s brand is a combination of mindful and playful. I’d have to say they nailed it. 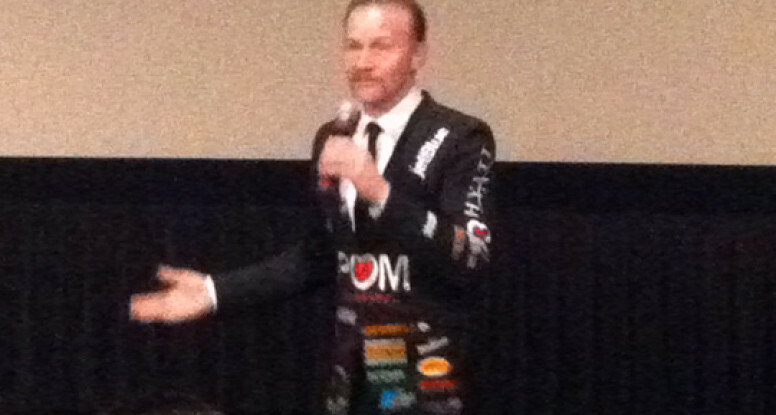 Spurlock is an independent filmmaker, but to me he is also a conceptual performance artist. The conceptual comes out in the way the film folds in on itself. The product and process are one and the same. He’s a performance artist in the way we used to mean it in the 1970s. Yes there’s a theatrical quality to his performance but more importantly there’s a kind of ritualized activity. He uses repetition and creates a public spectacle as he pushes the boundaries of his physical and emotional stamina. His audience serves as witness to his challenging journey of self-discovery. This can be seen most obviously in his first film Super Size Me (2004) in which he ate three meals a day at McDonalds for a period of 30 days. It started out funny but ultimately he put himself at physical risk and thus raised awareness about issues of diet, weight, health and class. His work has precedents in the tradition of performance art. One example is Eleanor Antin’s Carving: A Traditional Sculpture in 1972 in which she sculpted her own body through dieting and documented the process. Or the work in-progress Cut: A Traditional Sculpture by Heather Cassils who is doing the opposite by bulking up her body through a process of exercise and treatment. Cassils artwork is part of Los Angeles Goes Live for which I am also creating a new work for fall 2011. My performance about high heels is called Peep Totter Fly and like Cassils’ was commissioned by LACE for Los Angeles Goes Live: Performance Art in Southern California 1970-1983 as part of Pacific Standard Time, an initiative of the Getty. POM Wonderful is his primary sponsor earning the naming rights on the actual movie title. When Spurlock met with the company execs in the film I couldn’t help but notice the highly sophisticated art collection in their offices. I suspect on some level company founder Lynda Resnick also responds to the conceptual performance art aspects of Spurlock’s work. 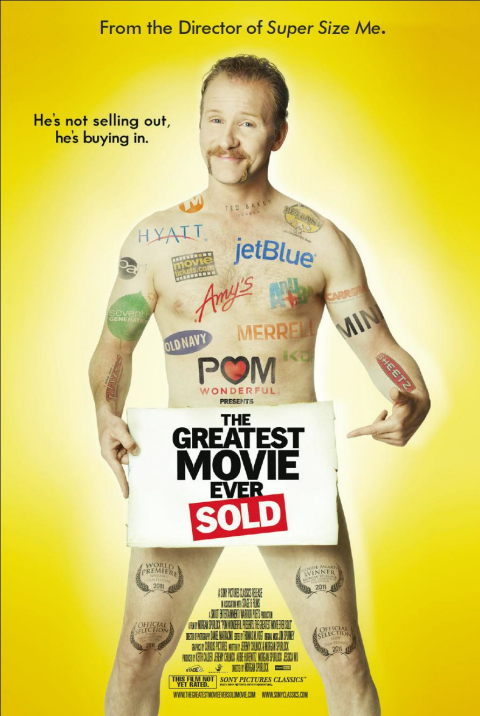 As a high school teacher of Video Art I am grateful to Morgan Spurlock. He brings a media literacy message to young people like my students. Appearing in his film are many of the people I use in my own media literacy curriculum from Sut Jhally to Ralph Nader. Go see it. Help him meet his box office goals. You’ll not only laugh, you’ll learn something. This may the only time you’ll see a naked man on my blog. Please vote for my project! Here’s a quick synopsis. 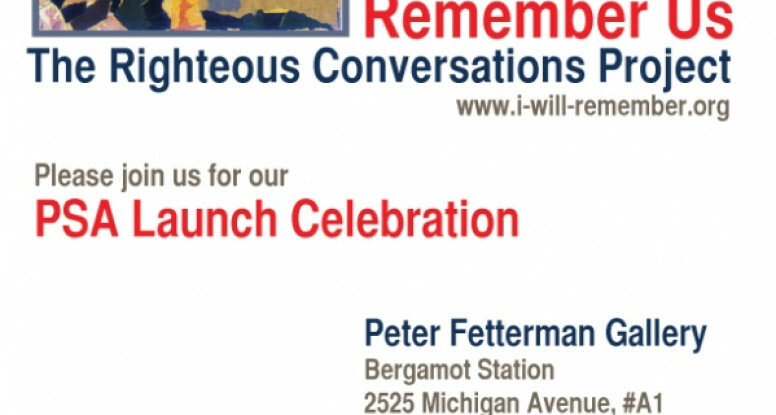 It’s called I Will Remember and it is a collaboration between Holocaust survivors and teens. There are three parts to it – events at which teens hear survivors’ stories first-hand, workshops in which teens make public service announcements about contemporary injustices, and a web site that showcases the PSAs. I am involved with the PSA workshops and in making a documentary about the entire project. Today’s teens are the last generation who will know survivors personally and from their interactions be moved to make a difference in their world. My commitment is to facilitate the teens to use media to speak out against today’s injustices – whether those be current genocides in Darfur, marriage equality, or conflict minerals in the Congo. We will help the teens become aware of various issues and they will choose what moves them to speak out. The project was generated by some Harvard-Westlake moms (some whose own parents are survivors) and their daughters. I am proud to be a part of it. Thanks for your help. There’s a wonderful short video that you can watch to meet some of the survivors and teens that we are working with. Feel free to pass this along to others! Saturday, June 19, 10 am will be the first of two screening dates for the Future Filmmaker Showcase, an annual feature of the Los Angeles Film Festival. Each year student films are selected from international submissions and I’m proud to say Harvard-Westlake student films have been represented every year since we started entering. This year we have a record four films in the High School Program #1. They are The Stand, Still Life, A Gum’s Life and Dem Shoes. The first three were created in my Summer Film Camp and the last one was created by seniors in my advanced video art class, all at Harvard-Westlake School. I am especially proud of The Stand, which co-stars my daughter Xochi in a comedic role. She has been getting great feedback on her performance from film festival judges as luminary as composer Randy Newman. My other daughter, Marka, is the assistant director. Through comedy, music, and documentary, these stories illustrate how teens (and some unfortunate pieces of gum) face love, death, commerce, depression, and even sexual harassment. Candid, poignant, and comedic, this collection gives us a peek into the challenges of their everyday teen existence. Program running time is 84 minutes. Tickets are $5 and can be purchased online at http://www.lafilmfest.com/2010/ or at the box office. Here’s more about my students’ films. A Gum’s Life (director Sophia Tran) combines stop-motion animation and live action to delve into a day in the life of a piece of chewing gum. Still Life (director Lee Feldman) is a silent-film love story gone awry when one lover gets stuck in the film frame and is separated from her love. Dem Shoes (directors Lucas Casso and Adam Maltz) is a hip-hop don’t stop music video celebration of one boy’s amazing collection of shoes. 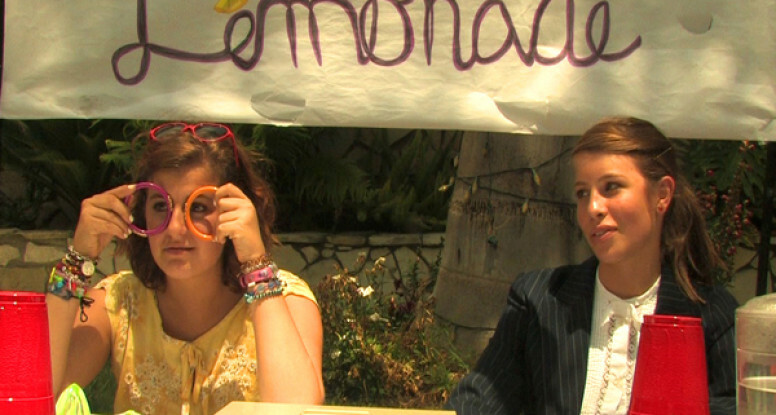 The Stand (director Olivia Chuba) is a mockumentary about trying to beat the competition. 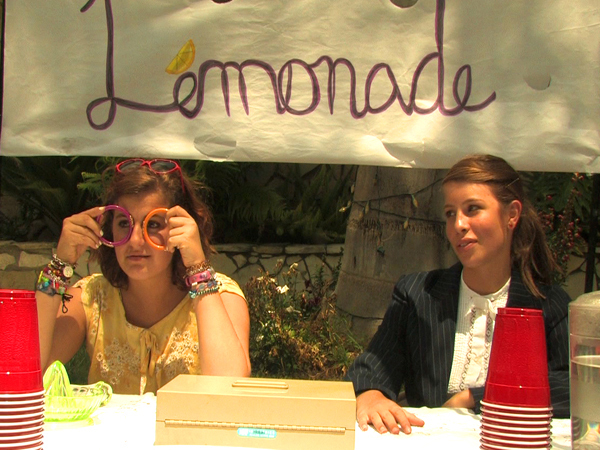 Two old friends – a free spirit and a control freak – set up a lemonade stand. Will their friendship survive when a boy moves his competing business next door? Come find out the answer to this and other questions tomorrow or next Saturday!